In this review of the Helix Moonlight Mattress we take a look at the original model by the company that introduced the customization by questionnaire model. Instead of the usual “universal comfort” one-size-fits-all models that most Bed-In-A-Box mattresses utilize, Helix Sleep, a popular brand known for its wide variety of mattresses, customizes your mattresses based on your individual sleep needs. Click here to save 75$ on a Helix Moonlight with our code MFT75! 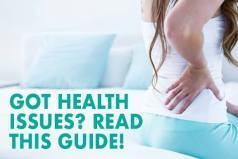 This in-depth review of the Helix Moonlight mattress evaluates all of the criteria we use to determine what constitutes a good mattress, which includes firmness / support, comfort, sleeping hot, and other features as outlined below. The Helix Moonlight mattress is a 10″ hybrid mattress made up of latex, hundreds of individually wrapped coils, and foam. 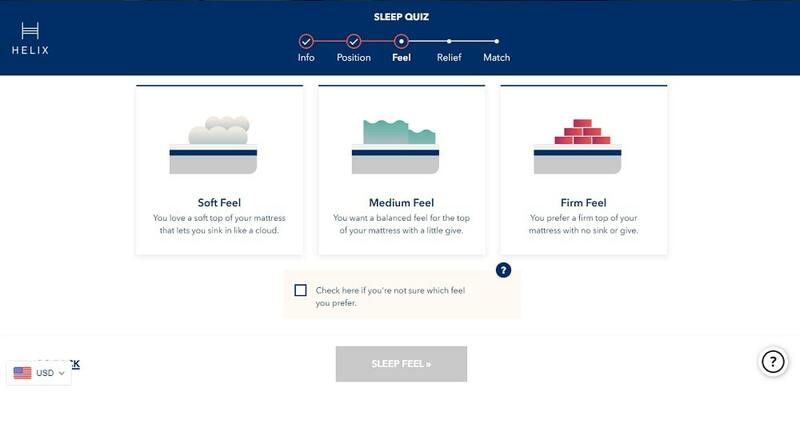 The construction of the mattress varies based on the preferences entered on an online questionnaire that is utilized to configure the mattress before it is built. 2″ Top Comfort Layer – This layer is 2″ of Helix Dynamic latex-foam hybrid alternative. It is extremely soft and designed to provide cooling and responsiveness to the mattress, contour to your body and make moving around in bed easier during the night. 1″ Transition Layer – This layer is 1″ of special Memory Foam Plus designed to provide ergonomic support and cushion your body. It is slightly firmer and serves as a transition layer between a softer top comfort layer and pocketed coils beneath. 6″ Body Shape Layer – This layer is 6″ of individually wrapped coils. There are hundreds of individual coils that serve to cradle and support your body while sleeping and limit excessive motion transfer. Reinforced perimeter offers additional support and excellent edge support while the whole layer allows greater airflow, adds to the overall breathability of this mattress and aids in cooling. 1″ Base Layer – This layer is 1″ of DuraDense high-density support foam that serves as the foundation and support for the mattress and increases its durability and stability. The cover of the Helix Moonlight mattress is made up of 100% polyester with a soft and stretchy white top and lower blue and grey bottom. The cover is thin and designed to assist in airflow and improve cooling. The Helix Moonlight mattress is unique in that there is no pre-set level of firmness that can be evaluated based on pre-set factory construction of the mattress. Like we mentioned in our previous Helix review, the entire idea behind the Helix mattresses is to do exactly the opposite – provide customized firmness and support for each sleeper, not only in one bed, but in one bed with different values for each side. This functions in a way that Helix takes the output from their questionnaire and either builds two individual mattresses, then fuses them together to create one, or takes the output from the questionnaire and designs a mattress blending both sleeper preferences. 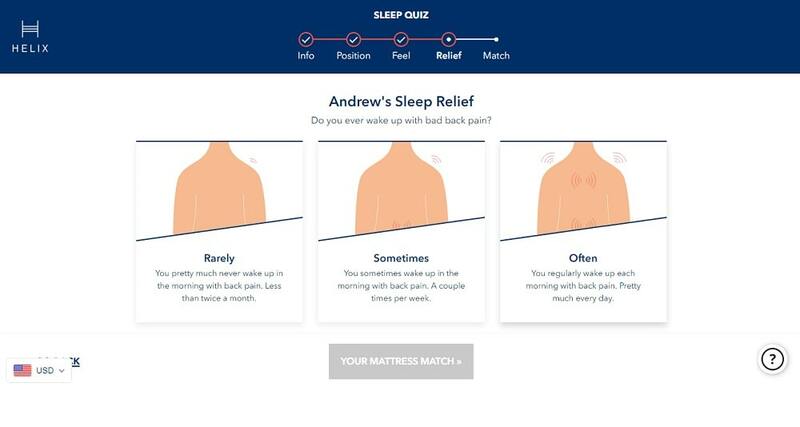 As part of our Helix Moonlight mattress review, we filled out the questionnaire that asks for each of our individual height, weight, sleep preferences, firmness preferences, and other specific information to design the mattress. Once the design and manufacturing is complete, the mattress is then delivered to your doorstep with the individual firmness, support, and comfort preferences that were defined in the questionnaire. In our case, my side (Andrew) required more support for my heavier weight, but a softer feel. This resulted in a mattress that felt around a 5 out of 10 on the firmness scale for me (10 being firmest). The soft top comfort layer offered a gentle feel and allowed me to sink into a mattress to a certain degree for pressure relief, but I never felt enveloped by it and stuck in foam thanks to the responsive material used in the construction of this layer. The slightly firmer memory foam layer beneath combined with the pocketed coil layer did an excellent job of lifting my heavy weight and providing the right amount of support to those areas of my body where it was needed most. These layers distributed my body weight evenly across the mattress and provided me with amazing pressure relief both when sleeping on my side and on my back. The Helix Moonlight mattress on my side had just enough give in the comfort layers to mold to my shoulders and hips and yet enough firmness necessary for back sleeping. As we have already mentioned, we love that Helix gives you the ability to combine individual firmness and comfort preferences in one bed and we really looked forward to doing the Helix Moonlight mattress review and we are totally satisfied, just like with the previous Helix mattress that we have reviewed. The Helix Moonlight, like the previous Helix mattress, did a great job of meeting our individual firmness and support needs and provided us with what each of us enjoy in the same bed. The Helix Moonlight mattress that the company has custom made for us is extremely comfortable. The combination of its latex-foam, pocketed coil, and foam layers with the soft and breathable cover works well to provide a perfect balance of comfort and support necessary for a comfortable and sound night’s sleep. The soft top comfort layer gives you the feeling of sleeping on clouds, reacts to your body shape, molds to it, and allows your body to sink into it to a certain degree for a perfect pressure relief. It also has a nice responsiveness which, when combined with the firmer foam layer beneath and bouncy pocketed coils, prevents you from sinking too deep into the mattress and feeling stuck in it. This also facilitates moving around in bed during the night and makes late night activities quite enjoyable. And the innovative individual mattress construction (split mattress) that we chose allowed each of us to have different comfort levels that we prefer in the same bed. The Helix Moonlight mattress does a great job at keeping things cool and comfortable all night long. 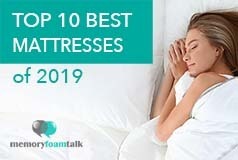 The combination of latex-foam layer with pocketed coil layer does a very effective job at preventing the build-up of excessive body heat during the night when compared to other mattresses we have reviewed. The mattress also comes with a special Two Touch Design cover created to increase airflow through the mattress and keep the top of your mattress cool at night. As for sinkage, the Helix Moonlight mattress varies in terms of the amount of sinkage depending on each side of the mattress and our weights. On my side, I compressed the top comfort layer quite a bit, but its responsive material and the firmer memory foam and pocketed coil layer beneath prevented me from sinking further into the mattress and feeling stuck in it. They perfectly worked together to support and lift my body and distribute my weight evenly across the bed. Kaye’s side did the same for her. It supported her lighter weight with ease and the split design of this mattress also stopped her from rolling into me due to our weight differences. She didn’t experience the common feel of “sinking into a hole” which is often the case with other lower quality mattresses. Edge support was great with this mattress and better than in most other beds due to the reinforced perimeter of the pocketed coil layer. It is true that I compressed the top foam layer when sitting and lying near the edge, but the firmer memory foam layer and pocketed coils prevented me from bottoming out. Kaye’s side did the same for her and we didn’t experience any “rolling off” the edges sensation. As for motion transfer, there is almost no motion transfer with this mattress due to its unique design. It allowed us to move around and get in and out of bed freely during the night without fear of waking each other. The Helix Moonlight mattress gets high marks in this category for not having much of a noticeable smell upon opening the box. The hybrid design (with roughly half the bed being constructed of foam) makes a difference with the amount of off-gassing. We experienced some, but it largely dissipated over the first few nights. Save 75$ on a Helix Moonlight : Use code MFT75! The Helix Moonlight mattress, just like the previous Helix mattress we reviewed, is very attractively priced for the customization and quality materials that you get upon purchase. It comes in at only $920 for a Queen, which is an excellent price given the quality materials and construction used in this mattress. The Helix mattresses are unique, unlike any other mattresses currently present on the online mattress market, and the newly released Helix Moonlight is no exception either. It is an innovative and high-quality mattress that differs from pretty much every other “Bed-In-A-Box” offering on the market. 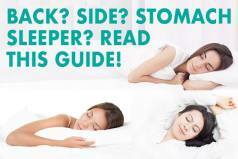 Therefore, their mattresses can have a split design and different firmness on each side, and such mattresses are a must for couples of varying weight and sleep preferences. This ability to have a mattress fully customized to our individual needs and sleep preferences makes the Helix Moonlight one of our favorite mattresses for couples for this reason alone. In addition, the Helix Moonlight mattress offers an amazing support, comfort and pressure relief. It sleeps incredibly cool due to the use of latex, pocketed coils and special breathable cover, and has minimal amount of sinkage and no motion transfer at all. So, if you share your bed with a partner and you disagree on firmness or comfort preferences, we highly recommend you the Helix Moonlight mattress and we hope that our review can help you in your next mattress purchase.